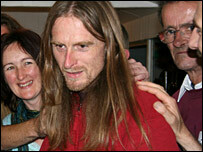 A Cornish man says he has broken the world record for sleep deprivation by staying awake for 11 days and nights. Tony Wright, 42, from Penzance, was trying to beat the Guinness world record of 264 sleepless hours set by Randy Gardner in the US in 1964. He fought off tiredness by drinking tea, playing pool and keeping a diary. The Guinness Book of Records has since withdrawn its backing of a sleep deprivation class because of the associated health risks. Weary Mr Wright told BBC News: "I feel pretty good, It's been a bit of a slog, but I got there." He said that his 'Stone Age' diet of raw food helped parts of his brain to stay awake and remain functional for long periods. He said: "It makes it much easier to switch from one side of the brain which is really tired, to the other. "But both are pretty tired at the moment." During the record attempt, Mr Wright noticed his speech becoming incomprehensible at times and colours appearing very bright. A webcam and CCTV cameras monitored him 24-hours a day. The attempt was part of Mr Wright's research into the body's relationship to sleep. He argues that parts of the human brain require a different amount of sleep and it is possible to stay awake and remain functional for long periods. He said the hardest part was staying in one place - Penzance's Studio Bar - in order to prove that he was not popping out for a sleep. He set out to keep a full video record of the entire 11 days as proof he stayed awake. A bleary-eyed researcher who normally sleeps like a log went to bed yesterday claiming a world record after staying awake for more than 11 days and nights. But when Tony Wright, 43, finally regains wakefulness today after catching up on his sleep, he could be in for a cruel awakening. The human guinea pig will discover that he may have given up ten hours too early to claim the crown. The record that he broke – of 11 days, or 264 hours – was set by Randy Gardner, an American, in 1964 and is recognised in psychiatric textbooks. But that is 12 hours shorter than the record which used to be included in The Guinness Book of Recordsbefore being removed from the book in 1989. It was deleted on the grounds that it could encourage records harmful to health and was unverifiable because of the claims of insomnia sufferers. The Guinness previous record was for 11½ days, or 276 hours, and was set by Toimi Soini in Hamina, Finland, between February 5 to 15, 1964. Mr Wright’s friend Graham Gynn, who co-wrote the book Left in the Dark, about their research into human consciousness, said he had no knowledge of the Finnish record. “It is interesting but has not cropped up at all in our research and is not mentioned in any of the books about sleep and sleeplessness,” he said. “It may have been disputed or not accepted for some reason because everyone now accepts the old record was set by Randy Gardner in 1964 when he was a 17-year-old student. A New York man has set the world record for underwater pogo sticking and broken his own underwater hula hooping record. Ashrita Furman travelled 1,680ft on his pogo stick and hula hooped for 2mins 38secs to secure the records. It's every little boy's dream - better than a Blue Peter badge or getting Jim to Fix it for you. And now Mirror reporter Damien Fletcher is glowing with pride after getting into the Guinness Records book. In page nine of the latest edition, published on 28 September, you will see him clutching his certificate for eating the most jelly with chopsticks and the world's fastest duvet dresser. Damien, 32, said: "What an honour. Mum will be proud. They say dedication's what you need but I'd also suggest a total lack of dignity. I tried anything." Damien spent a memorable day in October attempting records such as making sandwiches with his feet, balancing spoons on his face and attaching clothes pegs to his hands. After ten failures, he scored the first of a historic hat trick by wolfing down 180g of jelly in 60 seconds, easily beating the record of 45g. Then, after two failed attempts at the record for putting a cover on a double duvet - with every stopper closed - he beat the record by whipping it on in 63 seconds. He said: "The trick is to turn the cover inside out and put your hands in the corners before flicking it with a firm snap." Next, after two messy attempts, he cracked another record by holding a dozen eggs aloft in his upturned palm - but his record was smashed with 19 eggs held aloft before it could be published. Amarilis Espinova of Guinness World Records said: "He was determined to get in. The question is now can he break more? Its three stages have been graced by the greatest actors of the age declaiming Shakespeare, Chekhov and Ibsen. But tomorrow, the National Theatre will pose its audiences an even greater challenge - the world's longest silent play. For one hour and 40 minutes, 450 characters played by a total of 27 actors will flit back and forth across the stage of the Lyttelton Theatre and utter not one single word between them. For those who believe that the point of drama is passionate speech-making or sparkling verbal duels, they have reckoned without Peter Handke, an experimental Austrian playwright and the author of The Hour We Knew Nothing of Each Other which is to be given 30 performances at the National. "The point is to explore what's left when you remove language - and the answer is that there's a huge amount," James Macdonald, the British director of the play, explained. Though Samuel Beckett wrote a number of short silent plays - notably Breath, which lasted 45 seconds - and Harold Pinter's dramas are so fill of pauses that audiences may sometimes wonder if the dialogue is about to dry up, Handke's wordlessness is on an epic scale. There will not even be an interval for those yearning to hear the human voice again. The Hour We Knew Nothing of Each Other, a piece of typical 20th century Continental avant garde theatre, is set in a city square through which hundreds of characters - including a bride, a businessman, a roller-skater, a playwright, then Charlie Chaplin, Tarzan, Abraham and Moses - drift. There is no plot and any partial story - suggested by chance meetings - is left unresolved. Virtually no character appears twice. The idea apparently came to Handke as he sat at a cafe on an Italian piazza watching strangers come and go. If wordless, it is not entirely soundless. The silence is punctuated by snatches of music, the occasional scream and the recorded sounds of an aeroplane or workmen drilling. A National Theatre spokeswoman said: "It is a great piece of work, challenging and something that we should be doing." She went on: "Tickets are selling well - not like hotcakes, but they are doing well. It is appealing to younger people. We think our more traditional audiences will wait until the reviews." What's pointless about it? It's still a play, isn't it? Are silent movies pointless? Silent movies usually have a plot (and, quite often, speech captions). Seems to me you could get a similar experience to this play by going to a bar or cafe on a busy square and just watching all the people go by. Where's your sense of occasion?! And people used to go to the movies when the medium was in its infancy to watch ordinary people such as themselves wandering about and doing everyday things. What's wrong with harking back to that in theatrical form? Sounds ideal for people watchers and they won't get grief for staring at strangers either. Difficult to see how he can be a 'playwright' more of a choreographer really. A British schoolboy set a world record yesterday by balancing 16 spoons on his face. Joe Allison, nine, broke the record when he hung the tablespoons from his forehead, nose, cheeks and chin. Joe began practising his unusual hobby every day after his cousin dared him to try balancing one spoon on his nose two years ago. But Joe, from Totnes, Devon, can now hang a total of 16 spoons off his face - five from his forehead, one from his nose, two from his chin, three from each cheek and one from each ear. And yesterday, he beat the previous record of 15, set by a 16-year-old in the United States in May 2004. Joe's mother Fenella, 42, said: "I'm really proud of him because he can do something no one else in the world can do. It works even better if Joe's sweaty but I don't let him get away without washing." Joe is to appear on television show Britain's Got Talent, where he will hang the spoons from his face and do a jig. A cycling fanatic is hoping to enter his giant guitar-shaped bicycle into the Guinness Book of Records. Dieter Senft revealed his creation to the world's media and plans to register it as the world's biggest mobile guitar. But at 14.81 metres long and 4.21 metres high, the four-wheeled vehicle is too big to use on public roads. Muriel, Austin and Cecil are snails for the electronic age. The gastropods have been fitted with equipment to allow them to send e-mails on behalf of visitors to a website. Instead of instantaneous communication, sent messages will travel at 0.03mph (0.05km/h) and could take days, weeks or even months to arrive. It is part of a "slow art" project called Real Snail Mail at Bournemouth University in the UK which will be showcased in Los Angeles in August. "One thing technology promises us is speed, acceleration, more of everything in less time," said Paul Smith, a visual artist working on the project. "Culturally, we seem obsessed with immediacy. Time is not to be taken but crammed to bursting point." The researchers hope the project will encourage people to take their time and contemplate the technology and the work. Each snail is fitted with a tiny capsule which holds a Radio Frequency Identification (RFID) chip. RFID allows objects to communicate over short distances. Users of the service send a message via the Real Snail Mail website which is routed to the tank at the speed of light to await collection by a snail "agent". As the three snails slowly amble around the tank, they occasionally come into range of an electronic reader, which attaches the e-mail message to the RFID chip. The electronic messages are then physically carried around the tank by the snails until one of the gastropods passes close to a second reader. It is then forwarded over the net in the usual way. "It could be quite frustrating for some people," Vicky Isley, one of the artists told BBC News. "It's completely subverting that normal system." So far, the three snails have managed to deliver 14 messages. Users of the service will hope that Austin is on hand to collect their messages. The Snail has made 10 of the deliveries so far with an average delivery time of 1.96 days. "He's a super-powered snail - he's doing really well," said Ms Isely. "He's really quite big - he's always the one that gets to the food first." Unfortunately, Muriel is still languishing, waiting to make her first delivery. The project will be on show at the computer graphics conference Siggraph in Los Angeles from 11-15 August. I found this fascinating since, only yesterday, I saw a pond with many water snails, and several of them were crawling along the water surface - by which I mean they were upside down in the water, but using the air/water interface as a land snail uses the ground! I've never noticed that before. some cities, usually based upon a central hub topology. British artist Nasser Azam has created two sets of artwork in zero gravity, for a project called Life In Space. The London City Hall artist in residence, and a team of five painters flew up to 23,000ft in a specially modified transport plane to create the images. The accompanying video has a nice glimpse of one of the military-type minders having a moment! And it seemed to me that some of the more tricky bits of the pictures were done when there actually was some gravity to steady the artist. Even for the hardened adventurer, surfing in boiling waters just 20 feet from the flowing lava of an active volcano is pushing the boundaries of extreme sport. But for professional surfer CJ Kanuha the thrill of a challenge was too good to pass up. Hovering above in a helicopter, a photographer captured the moment he edged as close as possible to the molten lava of Kilauea volcano on Hawaii’s Big Island. Kirk Lee Aeder, who took the shots, said: "It was one of the most thrilling photo shoots I have ever had in my life. "One day I was talking to my pro-surfing friend, CJ and we began discussing the idea of him surfing, or should I say, stand up paddle surfing close to where the lava enters the ocean and that I would shoot it from a helicopter." "We both knew it would make for an amazing shot if we could pull it off," the 49-year-old added. Before attempting the stunt, the surfer left an offering for the mythical Hawaiian goddess of fire known as 'Pele' on a nearby beach. "Not leaving an offering could have resulted in bad luck, a value that most native Hawaiians strongly believe in," Mr Aeder said. Mr Kanuha, 24, was helped into position by canoeist and a jet ski, before paddling as close as he could. He said "I was tentative to get too close at first, and for good reason, the boiling water there is well over 200 hundred degrees in some spots, super hot, and it quickly melted the wax on the surfboard." The surfer, who suffered peeling skin on his legs from the boiling water, added: "It was an amazing feeling to get so close to the power of the lava from the volcano." Sounds like a potential contestant for the Darwin awards. A Scottish nurse broke a world record by setting himself on fire and running for nearly 100 yards engulfed in a ball of flames. Keith Malcolm, from Aberdeen, was doused in petrol before sprinting 259ft ablaze to beat the previous fire-run record of 227ft. To claim the record the amateur stuntman wore eight layers of protective clothing, including four layers of fireproof undergarments, a Formula One fireproof jacket and three overalls. He also wore three fire hoods and a helmet and coated himself in special protective "stunt gel" so he would not be harmed by the flames, which are believed to have reached 1,000C. Mr Malcolm, who now lives in Widley, near Portsmouth, Hants, set the new record at the Alton & North East Hampshire Agricultural Show on Sunday. He had a team of experts from Hampshire Fire and Rescue on hand for the event which was aimed at raising money for Cancer Research. Afterwards Mr Malcolm said: "It was absolutely awesome. I managed it in 17 seconds and was running flat-out. I really did not want to hang around. "There wasn't much left of the jacket at the end. To be honest, the heat I felt was what you would expect if you were wearing all those clothes and a helmet in hot weather and trying to run. Mr Malcolm took up the bizarre hobby last year but a previous attempt on the record in May failed when he fell over 40ft short of the record. Where's Elf'n'Safety when you need 'em, eh? So he started off with a blazer and ended up with a smoking jacket! I just don't get the whole Guinness Book of Records. A) Who cares? and B) Who cares enough to actually try to break a record? I think its the same sort of mentality which led to these famous explorers hopping naked to the north pole dragging a grand piano, when you read about these wonderous leaders of men you learn that they were mostly arrogant bullies who couldn't organise a piss up in a brewery and got there by more luck than judgement and often killed several people through their own stupidity at the same time. Members of a West Country cheesemakers group hoping to make the first space flight by a piece of Cheddar say they have lost track of it. At 0400 BST a weather balloon was launched 18.6 miles (30km) into the upper atmosphere, carrying a capsule containing a 300g wedge of Cheddar. But the organisers' GPS tracking system has stopped working and now they need help to find the cheese once it lands. They say it could land anywhere between Pewsey in Wiltshire and Hertfordshire. Dom Lane, of the Shepton Mallet-based West Country Farmhouse Cheesemakers group, told BBC Wiltshire: "We've been tracking the trajectory and the current prediction is that it could land anywhere from here in Wiltshire to Hemel Hemsptead. "The GPS isn't coming through on the web so we might need listeners' help to find it because we're not sure where it is at the moment." It was expected that the balloon would burst at the edge of space, leaving the capsule to float back to the ground on a parachute. The bizarre mission is to mark the 40th anniversary of the Moon landings. Philip Crawford, chairman of the West Country Farmhouse Cheesemakers, said: "We are very proud of our authentic Cheddar which we make by hand on our farms and we set ourselves the very highest standards. "It seemed appropriate, therefore, that we should mark the anniversary of the first Moon landing with a giant leap for 'cheesekind'." In 2007 the group used a webcam to allow internet users to watch a traditional round of Cheddar mature live on the web over the course of a year. From the video, the cheese seems to be sitting on a plate to one side of the capsule - seems to me that when the balloon bursts, it will very likely fall off. In which case it will probably land in some stretch of countryside where it will be eaten by wild animals. strangely enough, that reminds me of Crowley's attempt at K2. I forget if he managed to get anyone killed on that expedition though, or if it was just a bloody miracle that he didn't. A cheesemaker's mission to launch a wedge of cheddar into space ended in disaster after losing contact with its payload just minutes after lift-off. The 300kg chunk of cheese was attached to a weather balloon which lifted off from Pewsey, Wilts, at 4am on Tuesday. It floated up to the edge of space at 18.6 miles (30km) above sea level, where the 1.6m-wide helium balloon was expected to burst. West Country Cheesemakers, who organised the stunt, hoped the record-breaking capsule would then fall gently down to earth on a special parachute. However, the on-board GPS satellite system which was supposed to track the intergalactic dairy product failed shortly after take-off. It is still unclear whether the balloon succeeded in its bizarre mission until the missing capsule and its contents is found. West Country Cheesemakers believe the capsule landed somewhere between Wiltshire and Cambridgeshire. The project took them 18 months of preparation but cost less than £1,000. 300 grammes, methinks. As confirmed by Auntie Beeb. As a previous World record attempter, I have a theory as to why. As a result we, as individuals, gain a need to do something to not only fill our spare hours, but often to burn off the energy we would otherwise need to hunt, or whatever. Hence people do things which on the face of it if we were working the land, we'd find ridiculous; watching soap operas, playing squash, or even working an allotment. My grandfather, would probably find that notion that people do stuff mostly just for the point of doing it, rather than the need to do it for the end result as rather ludicrous. Don't get me wrong; I fully accept that working an allotment and growing your own veg is a worthwhile pursuit, but compared to spending 5 minutes ordering my stuff online, having someone else grow it, pick it, pack it and drop it at my door does seem an enormous investment in time for little return. I went to school with someone, who on the last day of fifth form proudly stated "that's the last book I'll have to read". Anathema to me, as I find books interesting/enjoyable/oddly fulfilling, but it's a fair point. I do not have to sit and read Vance Packard. I gain nothing from it except an understanding that a lot of weird government decisions were being made a lifetime ago, and are not a recent phenomena. I do not have a practical use for this, but will still berate my kids for watching TV and not reading a book. They would argue that, as someone once said, "books are like TV, only slower". So, we, as a society have evolved into groups who do stuff because it is "fun", "interesting" or simply fills a void in our days. This could possibly explain why people think paying 5 quid for a massively calorific coffee served by someone who looks down on them, is somehow a sensible proposition. I decided a long time ago that I would get myself in the Guinness book of records. Mostly so when my son was a little older and he said "what do you do" I can point at it and say "not much, but I did that". But the deed proved a lot harder than expected. Once you rule out expensive, dangerous or just silly records, the list is quite small. I picked something which I knew I could do, as it didn't depend on skill, money, or even practice. I would set the record for the fastest time going around every station in the London underground. Seems simple, yes? I soon realised that there were many, many difficult questions. Do I simply visit the same number that the existing holder went to? Or just the stations that are open now, and aren't closed for maintenance? Or those plus the ones which have opened subsequently? Do I include the DLR? Do I include visiting the closed, but sometimes accessible ones? Do I consider that I must do this all on the tube? Why? The DLR is public transport, so if I'm doing the DLR, I can't exclude it as a means of transport. When trains don't run, they lay on buses. So do I consider using alternative public transport rather than the tube in each direction? How do I prove I've been to each station at a given time? You can fake the date on photos. Do I do this on a weekday, when it'll be hellish during two rush hours, or a weekend when some stations are closed, but in general the non-tourist areas will be quieter? I ended up visiting the London Transport museum. Often. Talking to people, the London Underground, attempting to reach the previous record holder, buying many decent maps of London and marking all the stations and routes, trying to work out timings (as "a train every 3 minutes" doesn't help at remote stations that see one 3 times an hour). I made careful, copious notes, built a time table, then found this part somehow means I have to double back on myself, so I'll run out of day around the 22 hour mark. I worked, harder and harder but never reached a point when I felt I was equipped to do the attempt. This is pointless. I've wasted hours and hours of my life so far achieving nothing. I've spent a fortune on books, maps, and trips to the transport museum. I'd changed mobile plan to one which gave me free calls throughout London (before the obvious point that I was spending most of the time where mobiles didn't work), but it did not matter. I was becoming obsessed. I could tell you what line any named station was on. I could recite the stations on any given line in order. I could tell you which were closed, temporarily, permanently, or just at weekends. So why was I doing this? For the sake of doing it. I had too much invested, wasted too much time to simply write it off as an extended moment of madness. The end result? I do not, have not, and probably will not ever hold a World record, unless FT gives one for the most rambling post in their forums. My kids (including the aforementioned son, who is now 13), do not care what I do. They will occasionally ask, but they are far more interested in their lives than those of others. So for every single person who thinks that juggling chainsaws, or hauling ironing boards up mountains, or some other pointless endeavour is big, clever, funny, or somehow brings something into their lives which was missing, I salute them. I salute them. Every man, woman and fruitloop. You are all nutters, go read a book. A block of cheese launched into the upper atmosphere on Tuesday has been found undamaged in Buckinghamshire. The "interstellar cheddar" landed in Cressex - some 74 miles away - and was taken to High Wycombe police station on Wednesday night, the launch team said. The wedge was still in one piece but the flight-recording camera had failed. The helium pod's GPS system broke down soon after its launch to mark the Moon landing anniversary so the West Country Cheesemakers team lost track of it. It was found in a garden and handed in to the police, the group said. It had been attached to a weather balloon which was launched from Wiltshire 18.6 miles (30km) into the atmosphere. The helium balloon carrying the payload had burst, indicating it had reached a considerable height in the upper atmosphere. Dom Lane, of Shepton Mallet's West Country Farmhouse Cheesemakers group told BBC News: "I am driving back from High Wycombe with the cheese now. "I may try a bit to see if it has matured at high altitude and then it will probably go into a glass case at our production offices." He said the police were very helpful and highly amused at the whole operation. Mr Lane said he had given the police a selection of farmhouse Cheddars to pass on to the anonymous woman who found the errant cheese. "The whole exercise was a nice way to wave the flag for authentic Cheddar," he said. An Indian taxi driver, Harpreet Devi, has been given special permission to ferry passengers in his unique reverse car. The 30-year-old drives at speeds of up to 50mph in the Fiat whose gearbox he has redesigned to have four gears in reverse and one only one forward. Since 2003, the cabbie has been driving backwards after the state government in Punjab granted him permission to drive in reverse and he uses an ambulance siren to alert other drivers. Mr Devi, whose reverse driving has earned him celebrity status in the Punjab, has now been given permission to ferry passengers in his unique car. But after five years of driving in reverse, the cabbie admits that constantly looking backwards can be - quite literally - a pain in the neck. A South Tyneside man is claiming the world record for wearing the most pairs of underpants at the same time. Gary Craig from Whitburn put on 211 pairs - 11 more than the current official record of 200. The 51-year-old, who has dubbed himself the Geordie Pantsman, completed the task in 25 minutes. By the end, he said he looked like a "giant tennis ball". It will take four to six weeks for the charity fundraising attempt to be verified by Guinness World Records. The Sunderland-based architect said he came up with the idea after seeing a YouTube clip of a man wearing "loads of T-shirts". It was only after researching the topic that he realised there was an existing world record - held by an Australian television presenter. About 150 people gathered to watch Mr Craig's record-breaking bid at Dusk nightclub in South Shields on Thursday night. He began by putting on a pair of 40-inch underpants (size large) and finished with a 60-inch (size 4XL) pair. Speaking afterwards, he said: "It feels pretty sore at the minute but I'm just absolutely delighted. "I wanted to really crack it and give the Australians something to think about. I deliberately went one over the 10 just to make sure." He added: "The great thing was I had lots of people there to support me and that made a big difference. "I felt like if I'd had more pants I could have carried on." Mr Craig has so far raised about £3,000 for the St. Simon's Drop-in Centre for the unemployed and underprivileged in South Shields, as well as the Cancer Connections charity.